NOTE: I AM PREPARED TO DO THE PODCAST AT ANYTIME. SIVARAMA SWAMI HAS YET TO AGREE TO A DATE. 1. Vegans do not consume any animal products. All animal products involve animal exploitation. All animal products involve violence. There is no way around that simple and indisputable fact. 2. “Ahimsa milk” is complete nonsense. Here’s a link that concerns animal exploitation in dairy produced by those involved in the Hare Krishna movement. In any event, there can be no dairy without Himsa. I have invited Sivarama Swami to debate me on this matter, either in a podcast or in person. I have been assured that Sivarama Swami is going to engage me in a podcast as soon as he has time. I sincerely look forward to that podcast and I appreciate Sivarama Swami’s commitment to do the podcast. I note that Sivarama Swami did do a recorded general response to some of the criticisms he’s received (many of which have unfortunately been removed from the Facebook thread even though they were completely respectful) from his promotion of consuming dairy. That recorded response can be found here. In anticipation of our discussion, I had some preliminary thoughts that I look forward to discussing with Sivarama Swami. He says that the problem is that veganism is a “materialistic” philosophy and that we need only to do what God says we should do. Now, I would maintain that veganism has a very strong spiritual aspect rooted in the commitment to Ahimsa (as well as in various doctrines of moral realism). But let’s put that aside for now. I am curious as to the authority for the proposition that the consumption of milk is mandatory. Does Sivarama Swami maintain that the consumption of milk is required as a matter of religious duty? He certainly seems to say that because he says, among other things, that the Dharma of a cow is to give milk and the Dharma of a bull is to work and he says clearly and explicitly on that recorded message that it is violence to not respect those Dharmas. So to not consume milk or work bulls is violence. Therefore, their use for these purposes must be required. There’s really no other way to understand what he says here. Given that many Hare Krishna devotees are vegan, then those people are, according to Sivarama Swami, acting contrary to religious duty. They are acting contrary to what God wants them to do. I must say that I am skeptical about this. Moreover, even if there is authority for the proposition that milk consumption is required, that cannot end the matter. All religions have texts that have various injunctions that no one–including those who are profoundly observant–pays any attention to. For example, the Old Testament says that anyone who works on the Sabbath should be put to death. No one pays any attention to that. I could give dozens of examples of this from the Judeo-Christian tradition. So I went to this page, which I am told is a legitimate source of information about the Hare Krishna position to which Sivarama Swami subscribes. Does Sivarama Swami teach these moral injunctions from scripture to those who follow him? Does he tell the women who come to his lectures that they should never be independent? Does he teach that it is wrong for women to hold political office? My guess is that he does not do so. I have been reading the Laws of Manu in preparation for the podcast that Sivarama Swami has committed to have and I am finding many, many things that I feel quite sure that Sivarama Swami does not teach as required or even permitted. “8. Let him not marry a maiden (with) reddish (hair), nor one who has a redundant member, nor one who is sickly, nor one either with no hair (on the body) or too much, nor one who is garrulous or has red (eyes). Does Sivarama Swami tell his male followers that they should not marry women with red hair, or too much or too little body hair, or who are ill? Does he advise against marrying those who have a name indicating low caste, or who have physical defects? My guess is that he does not. So why is it that the consumption of milk occupies a different position? The only explanation is and can be that Sivarama Swami applies a standard other than what is found in scripture to determine what in scripture should be observed and what is not obligatory. Therefore, it’s not simply a matter of “what God says.” It’s a matter of what Sivarama Swami endorses or does not endorse. That is is the issue and I confess that his recorded statement did not help me to understand that at all. Indeed, it left me more confused! Sivarama Swami says that we don’t ask the street whether the street wants us to walk on it or ask the potato whether it wishes that we rip it out of the ground to eat it. He points out that the potato is alive. That is true. But the potato is not sentient in that it does not have subjective experiences. And if there is no difference between using a cow to get dairy or eating a potato, why is it not okay to eat meat, which Sivarama Swami clearly condemns? That is, if it’s okay to drink milk because we eat potatoes, why is it not okay to eat meat? Milk–even “Ahimsa milk”–involves exploitation and killing. I confess that I am very skeptical about Sivarama Swami’s claim that happy Hare Krishna cows give milk for 12 years after having a calf and without having another calf so there’s no need to worry about unneeded males being killed, which is standard in the dairy industry, even in India and even outside the intensive, commercial dairy industry. In order to give milk, cows must be pregnant. Some of the calves are male. They cannot give milk. They end being worked or they end up being veal. I must add that I am completely confused by his statement that we don’t ask the street if the street wants us to walk on it. The street is not only not sentient but is not alive so I am not sure why Sivarama Swami thinks we should be consulting the street about anything. But, again, I am sure that we will discuss this issue in the podcast that Sivarama Swami has, through his administrative assistant, agreed to have with me and to which I am very much looking forward. Sivarama Swami has agreed to do a podcast discussion with me as soon as he has time. He has not had the time so far even though I am ready to do this at any time that is convenient. He has, however, had time to do (yet) another promotion of “Ahimsa milk.”–a “Part 2” video. Sivarama Swami makes a number of points in this Part 2 video and I will not deal with them all at this time. I did, however, have some remarks. 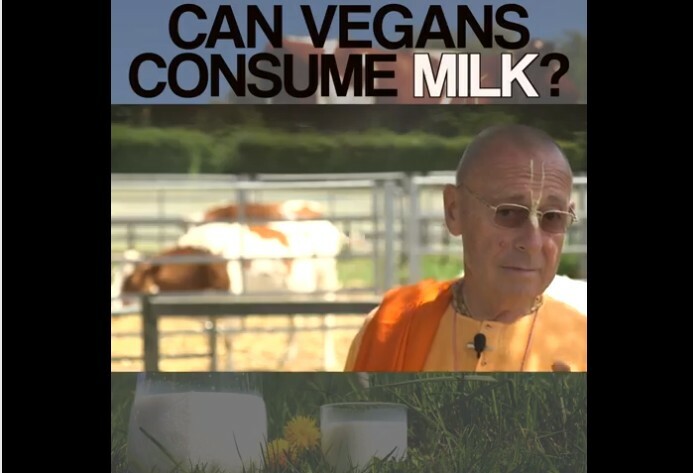 In this video, Sivarama Swami says that if cows are not milked, it will cause them to suffer. He misses the point in a rather significant way: the cow is only having to give milk because the cow is a dairy cow–a domesticated animal who has been impregnated and gives birth to a calf for whom she produces milk but where we take, consume, and sell what is claimed to be the excess milk. If we were vegans, there would be no need to milk the cow because we would not be exploiting the cow for milk in the first place. Sivarama Swami’s argument is no different saying that if we don’t cut off a person’s leg, he will suffer because his leg is seriously damaged and that we are doing a “good” thing by cutting off the leg, but neglecting to mention that it is we who damaged in his leg in the first place! Sivarama Swami again repeats this claim that the “happy” cows continue to give milk many years after they give birth, and without the need for another pregnancy. I apologize to his Sivarama Swami but I am more–a great deal more–than skeptical about this claim. 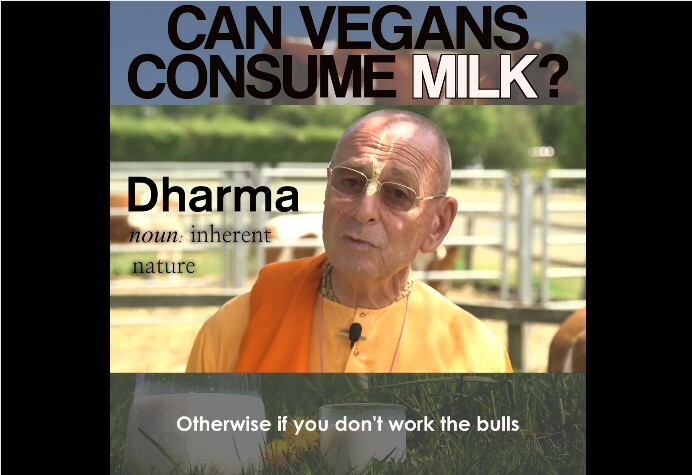 If Sivarama Swami’s claims were true, then there would be no more calves born and the Hare Krishnas could take, consume, and sell all of the milk. Sivarama Swami says that there is no more a need for “consent” from the cow as there is in the case of getting human children to consent. Again, Sivarama Swami misses the point. A child is not a domesticated animal owned by others, including parents. Cows are chattel property owned and exploited by humans. The Hare Krishnas may (and I say “may” very deliberately) be more benign slave owners. But let’s be clear: they are owners of the cows and bulls. Animal property can no more consent than human chattel slaves could. Sivarama Swami again fails to identify any scriptural authority for the claim that consuming dairy is mandatory as a matter of religious duty. Sivarama Swami claims that it is “violence” not to exploit the cows for milk and the bulls for work. That claim is tantamount to the claim that consuming milk is mandatory. Given that Sivarama Swami is too busy to engage me on these issues now, and given that I am sincerely interested, I ask any of his followers to point me to support for the claim that consuming milk is mandatory. And Sivarama Swami needs to explain whether he follows all of the very clear injunctions in Srimad Bhagavatam and Manusmriti, both of which I have been reading in preparation for the discussion that Sivarama Swami has agreed to have. There are some things in those works about eating flesh, and some things that are quite horribly sexist/misogynistic. If Sivarama Swami agrees with those things, then I think it will help us all to better understand Sivarama Swami means when he says he embraces Ahimsa. Frankly, if he does promote the idea that men should not marry women who are too hairy or not hairy enough, or have red hair, or are disabled, or that it is acceptable to eat certain meats in certain situations, then that would influence my views–and the views of others—about everything else he says. If he does not agree with and promote those things, many of which are clearly mandatory, Sivarama Swami needs to explain to us all why he does not agree with or promote those mandatory things, but he promotes dairy, even though there does not seem to be any mandatory injunction to consume it in the texts that (from what I can tell) Hare Krishnas regard as authoritative. And even if dairy consumption were mandatory (making all Hare Krishnas who are vegans acting in violation of their religious duty), Sivarama Swami needs to explain to us why, and on what basis, some religious duties are accepted and some are rejected. I certainly hope that Sivarama Swami will find time soon to have the discussion with me that he has assured me he will have. I am looking forward to the podcast discussion to which Sivarama Swami has agreed to have. If he would like, we could include Dr. Yamini Narayanan of Deakin University who wrote a guest essay on Sivarama Swami’s position for this page. I will update you as soon as Sivarmama Swami informs me of a time for us to do the podcast. Apparently, some followers of Sivarama Swami are upset that I have pointed to portions of Srimad Bhagavatam and the Laws of Manu that contain religious rules about women. They say that these rules about women have nothing to do with dairy or cows. I apologize if anyone was offended but these followers are missing the point. Sivarama Swami maintains that the consumption of milk is mandatory–it is something we must do in order to abide by what God wants. I am not sure that it is true that there is any such rule that makes the consumption of milk mandatory. But let’s assume that there is. There are many religious rules that tell us what God wants. For example, according to the scriptures, God wants men (or at least certain men) to do lots of other things, such as, according to texts that I believe are authoritative by the Hare Kishnas, not to marry redheaded women, hairy women, or women with physical infirmities. If Sivarama Swami does not promote these rules as rules that must be followed, then he needs to explain why he follows the rule that requires the consumption of dairy–assuming that there is such a rule in the first place. I am sorry if any of Sivarama Swami’s followers are offended by my argument. There is nothing that is offensive about it–unless my request that one think critically about one’s beliefs is considered as offensive. I am still waiting to hear when Sivarama Swami will do the podcast discussion with me that he has agreed to do and where we can discuss all of these issues. I am very concerned about the exploitation of cows and I assume that Sivarama Swami is as well. So I hope we will do it soon. It’s an important issue. I am ready as soon as he is.